In bodybuilding, as well as in every other sport for that matter, the question of who is the greatest to ever live has always been the most frequently pondered question and it remains so to this day. These discussions of who is the greatest of all time vary quite drastically from one sport to another, due to varying levels of dominance amongst each sport’s top athletes. For example, everyone would agree that Michael Phelps is the greatest swimmer of all time, as it is virtually irrefutable. Baseball on the other hand, does not have one stand out athlete who is or was heads and shoulders above the rest which sparks much debate on who the greatest of all time truly was. Basketball is another example of a sport where the overwhelming majority of people agree on who the greatest of all time was, as very few if any people refute the idea of Michael Jordan being the best of all time. Football is a second example of a sport that does not have a clear cut greatest of all time athlete. So what about bodybuilding, our beloved sport? Do we have a cut and dry best of all time like swimming and basketball, or is it up for debate between a few individuals, as is the case with baseball and football? The majority of bodybuilding fans and insiders would agree that the answer to this question is up for debate and a case could be made for several different athletes, such as Arnold Schwarzenegger, Lee haney, Ronnie Coleman, or even Dexter Jackson. Some will argue that Arnold is the best, not only because he won seven Mr. Olympia titles, but he also went on to become one of the most famous human beings in history. Others will say Lee Haney or Ronnie Coleman, due to the fact that they share the all time record of Mr.Olympia wins at eight titles. I have also heard decent cases made for Dexter Jackson for a multitude of reasons, including his unmatched longevity at the top of the sport and the fact that he was able to gain one-hundred pounds of muscle over his career. While I can understand the logic behind all of these opinions, I have to completely disagree with all of them. Before I move on I have to explain that when I refer to a man being the greatest bodybuilder of all time, I am basing that opinion on how great he was at the sport of bodybuilding itself. The reason this is important to explain is for the simple fact that if you consider what they managed to do for the sport, how successful they were after they retired, etc., then Arnold is obviously the greatest of all time by a landslide. However, the question has nothing to do with anything outside of the sport, it only has to do with how good each guy was at the actual sport of bodybuilding. With this in mind, the question becomes very easy to answer if you really think about it. The greatest bodybuilder of all time, hands down, is Lee Haney. To prove my point, I will first compare the Olympia careers of both Arnold and Ronnie with that of Lee Haney. Arnold won seven titles, one of which was extremely controversial, while the other six were won in a fairly dominant manner. Ronnie Coleman tied Lee Haney’s record of eight Olympia wins, with very few close calls. There was a lot of controversy in 2001 when many people felt that Jay Cutler was the rightful winner, but that’s about it. Lee Haney’s run as Olympia champ was very similar to Ronnie’s, in that Lee also had one controversial win in his eight year run, which came by way of a drug tested show and a spot on Lee Labrada. However, there is one major difference between the two that is proof to me that Lee Haney was a greater bodybuilder. Lee Haney won his last Olympia in a convincing fashion, displaying the best look of his entire career, then chose to retire on top. Ronnie on the other hand, was defeated, then failed to break the top three the following year. In other words, Lee Haney retired at his peak, or possibly short of his peak, while Ronnie peaked in 2003, then was dethroned in 2006. Not only could Lee Haney have continued to win the Olympia for several more years and set a record number of wins that would never be touched, but a “new age” competitor like Dorian Yates may have pushed Lee to heights the sport has never seen. In bodybuilding, ones mid to late thirties is generally accepted as their peak age. Lee Haney retired at 31 years old, meaning he was far from his peak in regards to his age. In short, it is entirely possible that had Lee continued to compete, he may have won ten or more Olympia titles, in which case he would be considered the greatest of all time by a large margin. The best Dorian we have ever seen would probably defeat the best Lee we have ever seen, but with Lee retiring half a decade before reaching his peak age, it’s not really a fair comparison. The assumption that the great Lee Haney would not have been able to find a way to beat The Shadow is even more unfair. 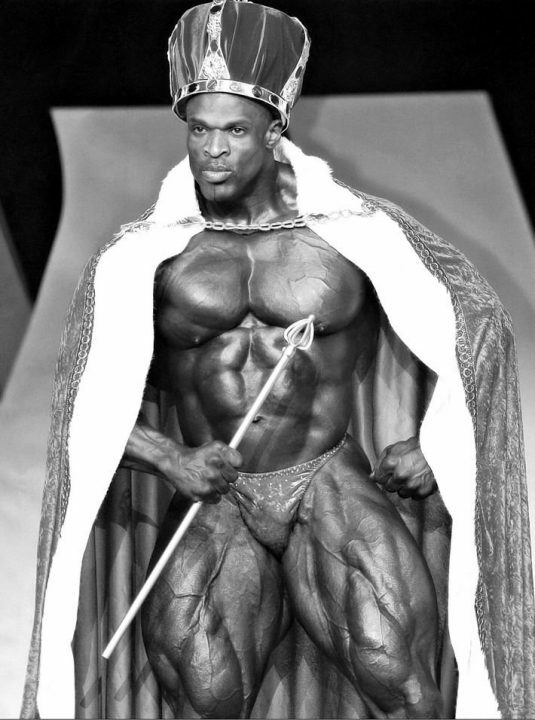 Can anyone name another Mr. Olympia champ who would have been capable of winning several more titles after his last win, assuming he did not retire? There are no examples outside of the great Lee Haney. Arnold barely won his last show and probably shouldn’t have, Dorian also won his last title by the skin of his teeth and was far too riddled with injuries to ever win again, while Jay Cutler and Ronnie Coleman were both handily defeated at their last two Olympia showings. Not only did Lee Haney win a record eight Mr. Olympia titles, but he went out on top at a mere 31 years old with enough left in the tank to win a few more titles. While we were lucky enough to see the very best of guys like Arnold, Dorian, and Ronnie, I do not believe that we ever saw Lee Haney’s full potential. One can only imagine what his full potential may have looked like. For all of these reasons, the question of who is the greatest bodybuilder of all time does in fact have a quick, easy answer: Lee Haney.